Some days it feels like I'm drowning in alternating seas of snarky cynicism or over-polished commercialism, and that is never more overwhelming than around holidays. Some days I just want to throw my hands up and say "fine! Nothing is good, or worthy, or perfect, so I won't celebrate anything because I'm going to get something wrong, or offend someone, or not offend enough people, or something." But today, I'm going to realize that the only thing I can control is myself, and that change starts with one person. So I am going to ignore the snark on one side and the hype on the other, and reclaim my favorite holiday for the joy that it can bring. For me, Thanksgiving is about gratitude and welcome. It's about being present with people you love, or showing love to people you don't know very well. It's sharing food with family, playing games or watching movies, or going for a long walk or hike. Whatever it is you enjoy doing together. It's about sharing a meal with people who have no family, creating a community where you are. It's about reaching out, gathering in, and being thankful. And to me, Thanksgiving is about finding some inner rest -- embracing a season in which nature pauses and just takes a break after a season of working really hard. It's a potluck lunch with people whose family live scattered across the country, each person bringing their favorite family dish and then getting to enjoy other families' traditions as you share your own. It's grilling bratwurst on a balmy day at the beach, when it's just you and a couple of other friends. It's not the number, it's the company. It's 25 people packed around tables spread in the backyard -- being included in a big family gathering because your family lives far away. It's aunts, uncles, cousins, and a foreign exchange student from Switzerland. Pie, card games, and some low-key football outside. It's all-day games, movie marathons, and music. It's meeting someone the week before who has no Thanksgiving plans, and inviting them to your home. It's sharing, giving, and being grateful. Celebrating sometimes, and sometimes just trying to find any reason to give thanks. It's remembering those who aren't there, and sometimes being a little sad. Whatever form your Thanksgiving takes, may you find what you need, give what you can, and enjoy it! I have several books that sit on my Kindle that are kind of "backup" books. Books I purchased because I wanted to read them someday, but I want to pull them out when I'm not in the mood for something else, or I've hit a crossroads when it comes to 'what to read next' or I don't have any library books. 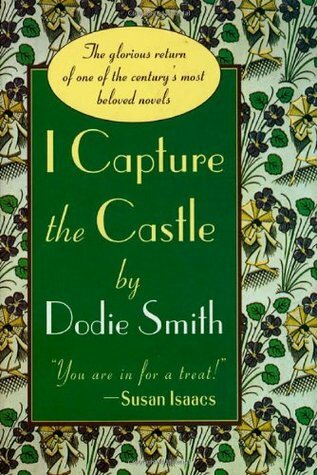 I Capture the Castle, by Dodie Smith was one of those books. And I admit that I bought it so long ago, I'd even forgotten what it was about. But sometimes, that's a pretty great experience, and it certainly was with this book. I Capture the Castle is the story of a family, a snapshot of their life told through the journals of Cassandra, the middle of the three Mortmain children. It's the mid-1930s in rural England, and the Mortmains are a once upper-middle class family who have run out of money. Mr. Mortmain is a famous literary author whose critically acclaimed book has stopped earning money. Mr. Mortmain sits all day in what is essentially his study or office and reads books or works crossword puzzles. The children's mother is deceased, and Topaz -- Mortmain's wife -- is a former artist's model whose earning potential we quickly discover is small at best. Rose, the eldest daughter, bemoans the family's poverty and longs to find herself a rich husband ala a Jane Austen heroine. Thomas, the youngest, has a scholarship and attends a good school. Cassandra wants to be a writer, and has begun practicing speed writing with the thought of one day training to become a secretary. Stephen, the orphaned son of the family's former housekeeper, helps around the castle, in the garden, and eventually gets a small job at a neighboring farm. The family lives in a crumbling down old castle with a Tudor home built into the ruins. Cassandra begins keeping her journal to capture life at the castle, and ends up capturing a brief period of time in which life changes quite dramatically. I don't have much to say about this book except it was really just delightful, quietly funny and engaging. Smith does a great job of evoking a sense of place, and I really felt like I'd taken a little mini-vacation to rural England by reading this book. It's a book about family, friendship, romance, and making your own happiness. 1. It is a beautiful day here. 2. Life lesson: there isn't time for all the things. And if there IS time, there isn't energy, or mental power, or emotional power. You gotta choose, and them make peace with your choices. And remember that you can usually choose differently tomorrow. 3. On Tuesday I finished the last of the coffee that my friend Megan sent me from Port City Java. However, that very same day I got a package in the mail with coffee from GuateJava, which supports the non profit Global Community Works, an organization doing really cool things for sustainable development in Guatemala. This is proof that God is a coffee drinker. 4. I ran on Tuesday. Well, I ran/walked. Couch to 5k, week 1, day 1. It wasn't pretty, but it was awesome. I'm hoping to do day 2 on Friday (it's the next best day schedule-wise). With a little and a littler, I'm not putting too much pressure on myself, but I figure a girl's got to have goals, right? 5. Speaking of goals...I see you sitting over there unfinished novel. I haven't forgotten you, I'll just refer you to #2. 6. I'm anxiously awaiting a few library holds, so I started a book that's been chilling on my Kindle for a while: I Captured the Castle. Haven't made it too far yet, because I was catching up on iZombie (fun show, by the way). 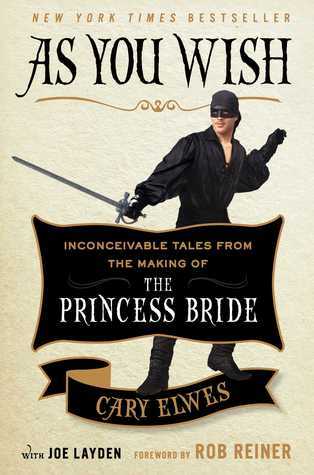 As You Wish, by Cary Elwes with Joe Layden is a must-read for any fan of The Princess Bride, or any fan of film making. With the help of several of his Princess Bride cast-mates, Elwes walks the reader through the entire creation of this classic film. It's clear that everyone involved in this film sees it as one of the highlights of their career, so there's that perfect sense of nostalgia and warmth. It's like a family reunion without any interpersonal drama, just fun stories and lots of compliments. And although that may make it sound bland, it's the drama of the film itself that keeps it from being saccharine. Elwes takes you on a journey, from the casting, to the epic sword fight (who knew that Elwes and Mandy Patinkin practiced six days a week for almost the entire duration of filming), to silly accidents, and the challenges of shooting scenes with the hilarious Billy Crystal (Mandy Patinkin apparently cracked a rib from holding in his laughter). It's really just a delightful book. And it's really great in audio, because Elwes reads it himself, except for the little parts written by his friends, which are read by those individuals: Rob Reiner, Billy Crystal, Robin Wright, Chris Sarandan, Christopher Guest, and a few others. And be prepared: you will want to watch the movie immediately upon finishing this book.